Hameeda Bano, a professor of English and women’s rights activist, talks of “a deliberate genocidal attempt by the government of India”. Her husband, Nayeem Khan, a politician who heads the Jammu and Kashmir National Front, echoes local complaints that the Indian security forces, with their helicopters and boats – who say they saved nearly 200,000 people – rescued their own troops first, followed by Indian tourists and construction workers from Bihar and Uttar Pradesh, and ignored Kashmiris except for a few sorties for the benefit of television. Such reporting is repetitive, tiresome and sickening. The intent of the West is as transparent as water and their sincerity is as transparent as mud. Coming soon after his report on the allure of Modi fading for foreign companies, he could consider changing his name to Victor Malicious Mallet. I would recommend this site ‘Investing in China stocks’ for a good dose of reality check on China’s macro and other developments. 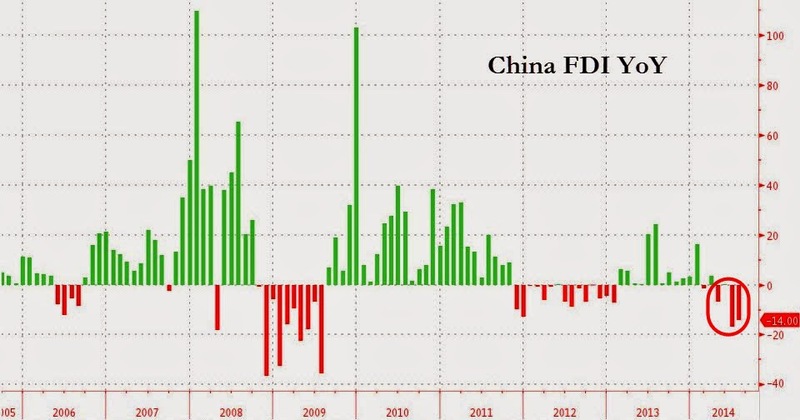 Just the other day, I had posted a chart on declining FDI into China. That was from this site. The falling FDI (negative Y/Y change) is consistent with what I read elsewhere that major international brands were postponing expansion or even closing down their existing stores. They are not renewing their leases (Gucci, Swiss watchmakers, etc.). Here is the link. Well, this chart itself appears to have come from another site. This post has several other interesting charts. Japan, USA, Europe and China all took turns to be the engine of the world economy between 1980 and 2010 but now we are engineless until circa 2020/2025. 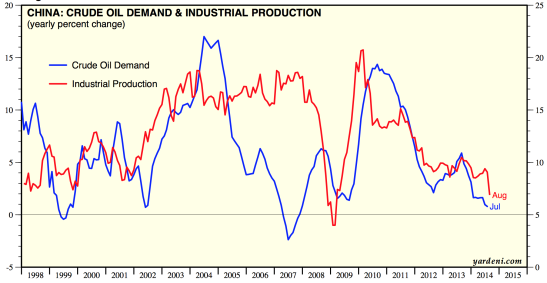 By demographics that means a global deflationary recession, or a depression. Passing through the solar maximum here in 2014 should produce dwindling speculation and economic activity and nudge the stock markets and world economy over the edge, feeding off each other. I would say ‘Amen’ to that. You are demanding a huge amount of honesty in the system when you put people in charge of Rs.5-10 trillion of assets, give them absolute command, and tell them they are here for one or two years. If you give them that kind of structure—low salary, absolute command and a limited time period—you are creating a perverse incentive. The people who stay honest in the system are showing that it can be done, but the system has to be such that you recognize the temptation and you don’t require somebody to be above average in terms of honesty in order to stay honest in the system. Also, he showed remarkable intellectual openness in minimising the role of ownership in banking. But in the meantime, if I had absolute power, I would perhaps let one small public sector bank be privatized and see what happens. Learn from that….. To my mind, however, ownership is relatively a small aspect if you have the right governance. This is not a flip-flop. If one read the Indian version of ‘Faultlines’ (I did it during my two months of back and forthing between Bangalore and Singapore in June-August this year), one would notice that he has been consistent. Even in that book, he described himself as a pragmatist rather than a capitalist or a free-marketer. This blog has consistently argued that economic policy-making would be a lot better if it was not bogged down by ideology. Economic policy-making has to be empirical and not ideological. In fact, in that book, he had interestingly proposed that policies dealing with early stages of life (infants and children) could be more interventionist and welfare-oriented whereas policies dealing with adults could be more laissez-faire or market oriented. He explains the logic for this duality quite well. It makes sense. Economic growth in India, driven primarily by private enterprise, requires large amounts of capital. Channelling India’s high household savings to such productive economic purposes is prudent. Appropriate taxation and other policy measures to wean retail investors away from risky, unproductive derivatives, to investing in primary and secondary markets will augur well and be the harbinger for healthy equity markets. One would have thought that this statement was on par with ‘Motherhood’ and ‘Apple Pie’. Not quite. Ms. Susan Thomas wrote a rejoinder to Praveen and Somanathan. In my view, her article did not make any substantive point. Most of her statements about the usefulness of derivatives (e.g., price discovery, a short-cut to overcoming funding constraint) were theoretical in nature and were not backed up by any proof in the Indian context. Praveen Chakravarty, Ajit Ranade and I wrote a piece in MINT, pointing out that the ratio of derivatives trading vs. cash-market trading was well in excess of what was recommended by the L.C. Gupta Committee on Derivatives. We certainly did not propose any ban or restrictions but recommended spraying a bit of sand in the wheel of speculation. Frankly, in our article in MINT, we had not said anything that the reports on Financial Stability issued by the Reserve Bank of India have not said. You can read what the RBI has said in my note linked above. World over, the crisis of 2008 has prompted remedial action. The complacency among capital market participants in India on the extensive use of and trade in derivatives is surprising, to say the least. That was the theme of a recent article in Wall Street Journal. Now, we can easily detect the article’s bias. The picture chosen for the article also gives the bias away. We can also justifiably question the sustainability of China’s boom, built on debt. In that regard, readers should bookmark this site. For example, check out this graph. I am giving a thumbnail below for easy viewing. But, we are digressing. If we focus exclusively on the Indian challenges mentioned in the article, one has to admit that the list is very formidable and accurate. We should recall James Tooley’s brilliant book, ‘The Beautiful Tree’. While many other countries had India’s problems with primary education, China was an exception. Regardless of how China fares from here on (and it won’t be pretty, at least for the next five years), India’s education challenges are very, very serious. PM Modi’s USP has to be ESP – Education, Sanitation and Power. Some interesting links on financial markets. At the end of it, you can draw your conclusions. This Reuters news-item features comments from the latest BIS Quarterly Review. I am yet to read the Review. BIS is concerned about elevated asset prices and holds ultra-loose monetary policy responsible for it. BIS also warns of the risk of low volatility and portfolio shifts by asset managers for Emerging Markets. OECD has reduced growth forecasts for the world economy and Europe, in particular, for 2014 and 2015. Still 1% real GDP growth for France in 2015 is excessively optimistic. Goodbye to capitalism and hail Financial Engineering – WSJ article on Share Buybacks by US companies. Mohamed El-Erian questions the market’s rose-tinted glasses. I think it is more like investors are blind to certain things completely. Martin Hutchinson on the death spiral of capitalism [Link]. There should be no doubt as to which way policy-makers will turn when asset prices crash. Professor Robert Shiller, in his latest article, draws a parallel with 1937. Well, more people are beginning to realise that a re-run of the events that led to the First World War and/or Second World War is beginning to take shape. We should remember that history does not exactly repeat itself but rhymes. This one appears to rhyme rather too well, for our comfort. It might be an exceptionally difficult 2015 for the world. I had alluded to this in two of my MINT pieces. You can read them here and here.